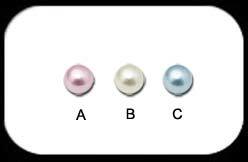 Synthetic pearl ball for 1.6mm bar (pack of 2). Available in 4, 5 or 6mm diameter & in Pink, Light Blue or Cream colour. Not suitable for tongue piercings.